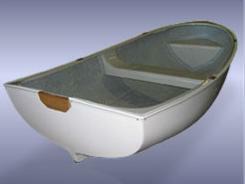 The MK Dinghy is not only a wonderful sailing dinghy, but an excellent yacht tender and row boat. Her simple rig enables sailors of all abilities to enjoy the water. Her airtanks also act as the bow and stern seats to keep her afloat even when full of water. Her hull shape allows her to track very well when rowing or being towed behind a cruising boat. With a 4 person or 491 lb capacity maximum she has plenty of room for shuttling passengers and gear to a cruising boat. She performs well with a 2hp motor or a set of oars and is easy for one person to handle on and off a dock. * RETIRED DESIGN NOTE Retired Cape Cod boats were built at one time, but due to a lack of owner support have been removed from regular production. The fiberglass molds to build these boats remain at Cape Cod Shipbuilding Co. but custom replacement parts may not be readily available. 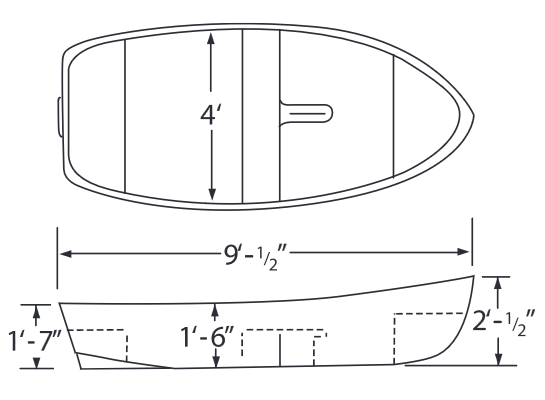 A retired boat could be built, but a fleet order would need to be placed to bring the molds into the shop. Weight Rowing Model 98 lbs. Weight Sailing Mode with sail 128 lbs. Sail Area 45 sq. ft.